Time for one more meet for today. This evening, it's Ohio State (or THE Ohio State) at UCLA. It's always interesting to see what UCLA will do, they've got this talented bunch of former elites, Olympians etc. This week has apparently been brought to you by the Twilight Zone, so we'll see what happens. Hopefully no on lands vault in another dimension. UCLA will start on vault and THE Ohio State will start on bars. Jim Watson was saying this is the first time these two teams have met during the regular season. That's interesting. Both teams are looking especially sparkly today. Jenna Schwartzentruber UB Ohio State - maloney + pak, nice, toe shap 1/2, DLO, just a bit low, steps forward but lands it. Second rotation - Ohio State moves to vault, UCLA moves to bars. 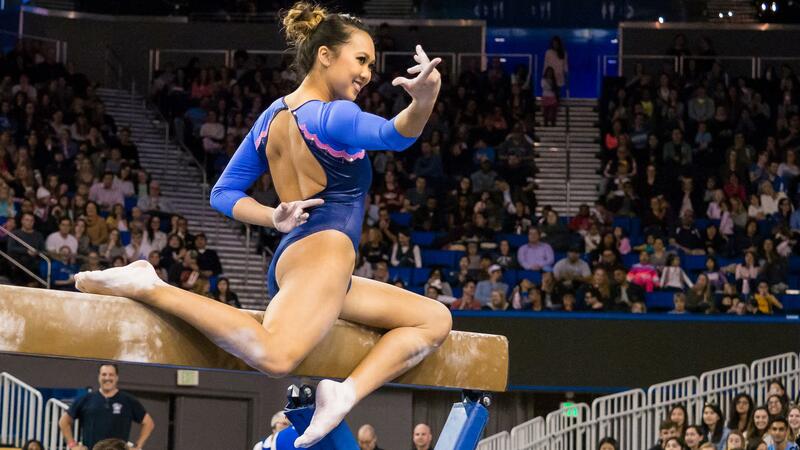 Katelyn Ohashi UCLA UB - toe on + bail, bit short on that HS, tkatchev, DLO, small hop. On to rotation 3 - UCLA is on beam and Ohio State is on floor. On to the final rotation, UCLA will be on floor, Ohio State finishes on beam. Ok, they've changed the beam scores, they updated Fish's score to 9.725, pushing the score for UCLA on beam to 49.025, better but still not UCLA standard. I'll be back on Friday at 5 p.m. MST time for the Florida's home opener against LSU!